If you're in the Big Apple for Thanksgiving, why not check out some big balloons? A fun outing is to see how the Macy's Thanksgiving Parade balloons come to life. 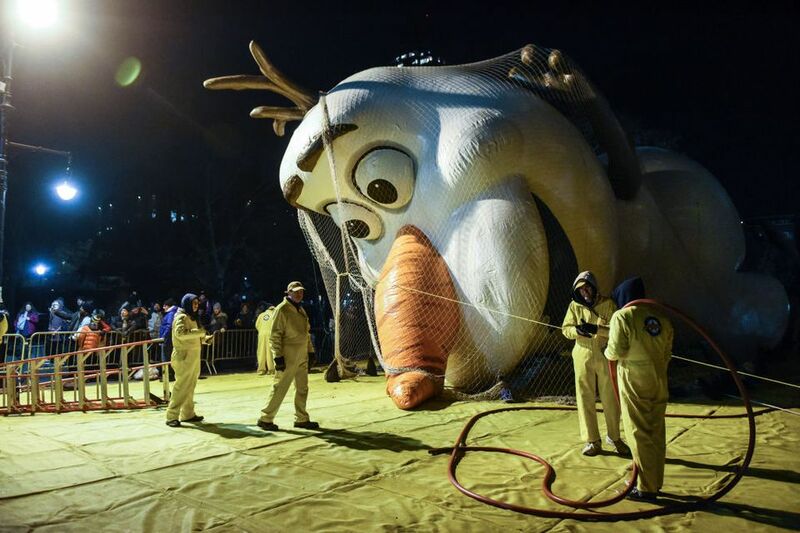 Taking place in the afternoon and evening before Thanksgiving Day, the Macy's Parade balloon inflation provides an exciting preview of the larger-than-life characters you'll see in the next day's parade. Once they are inflated, nets and sandbags are used to keep them from escaping during the night. The inflation takes place at the American Museum of Natural History on the Upper West Side. You can access it at the public entrance on West 79th Street and Columbus Avenue. If you plan ahead and strategize, you'll be in for a real treat as the balloons come to life right before your eyes. Here are some tips for that strategy session. The earlier you arrive, the less crowded it will be, but also the less impressive. You can enter the viewing area at 1 p.m., but keep in mind that the balloons really begin taking shape around 4:30 to 5 p.m. and the last admission to the balloon inflation area is 8 p.m. Shortly after 1 p.m., there are some balloons that are already in the process of being inflated. If you show up later in the evening, there will be many more balloons to see, but the crowds will be much bigger, too. There is a designated viewing path for observers. The path for the balloon inflation winds around the American Museum of Natural History, beginning at 79th and Columbus and travels along Columbus Avenue, 77th Street, Central Park South, and exits at 81st Street. How and where you arrive is important too. Consider taking public transit to the balloon inflation. Crowds will make parking nearby nearly impossible and access to the area will be difficult for taxis because of the closure of some streets. The subway trains serving the balloon inflation area are B or C to 81st Street/Museum of Natural History. If you want to see all the balloons being inflated, take the 1 train to 79th Street and walk to the viewing area entrance at 79th Street and Columbus Avenue. If you just want a taste of the balloon inflation, watch the balloons on the north side of the museum and then head back into the subway to avoid the crowds. If you're visiting with young children, keep a close eye on them. It gets crowded, and once it's dark, they can be hard to keep track of. Kids really love watching the amazing sight of seeing the balloons being blown up, and they enjoy trying to figure out which balloon is coming up next. Keep in mind if you're visiting with young kids that this scene is very crowded and by 5 p.m. it's fairly dark. It will be hard for kids to see much from within the confines of a stroller but a shoulder-ride is ideal. You must keep them within arm's reach. If you do get separated from your child, there is a large police presence, and the folks staffing the balloon inflation are friendly and helpful, so let someone know as soon as possible. It's super helpful if you know exactly what they're wearing, so it might be a good idea to take a picture before you get there. It's also important to have water and a snack with you. It will probably take between one and two hours to make your way through the entire viewing area, depending on how much you like to examine the balloons and how dense the crowds are. There isn't really anything for sale within the viewing area, and you don't want to have to leave mid-viewing (which isn't terribly easy to do anyway), so do yourself a favor and bring a drink or snack if you think you or your kids will be hungry or thirsty. Giant helium balloons first appeared in the parade in 1927, replacing the live animals that once participated. The balloons were the original creation of Tony Sarg, a Macy's designer, and famous puppeteer. Felix the Cat (the parade's first character balloon), a dragon, an elephant, a hummingbird, a dinosaur, a dachshund, and a Toy Soldier, were among the first balloons in the parade. In 1927, the balloons were filled with air and held up with sticks. In 1928, helium was used to fill the balloons and keep them aloft. From 1928 to 1933, the giant balloons were released at the end of the parade. Beginning in 1929, the balloons released at the end of the parade featured a return address label and $100 was awarded to those who returned the balloons. In 1934, the first Mickey Mouse balloon appeared in the parade. In 1942, the balloons were donated to the World War II cause as rubber was needed for life vests, lifeboats, and more. In 1958, a helium shortage meant that the balloons had to be inflated with air and hoisted with cranes for the parade. Depending on the balloon size, it takes 30 to 100 balloon handlers to guide the giant helium balloons along the parade route. Falloons, introduced in the 1980s, are float-based cold air balloons. Balloonicles, introduced in 2004, are self-powered cold air balloon vehicles. Tricyloons, introduced in 2011, is cold air balloons attached to a tricycle.